The fossil, discovered in Dinosaur Provincial Park just north of the Montana border, is of a member of a bird-like family of theropods that lived from Canada to Colorado some 75 million years ago. 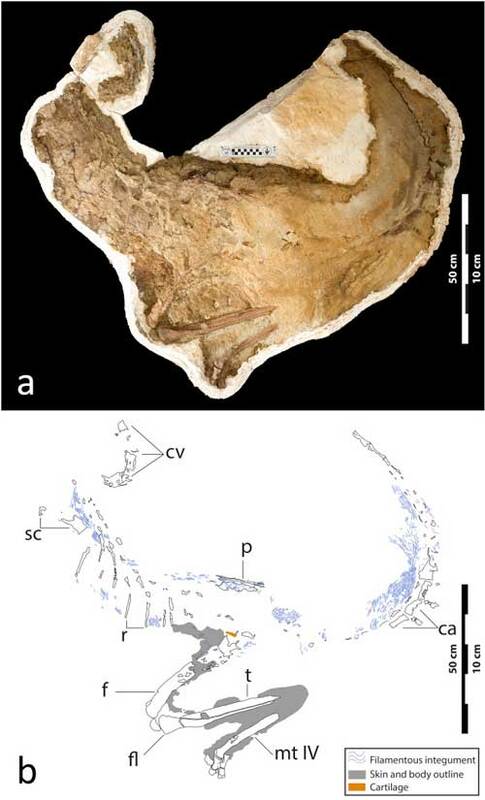 The new specimen is the first of its kind to be found with a complete, feathered tail and clear impressions of the skin around the upper leg and torso. 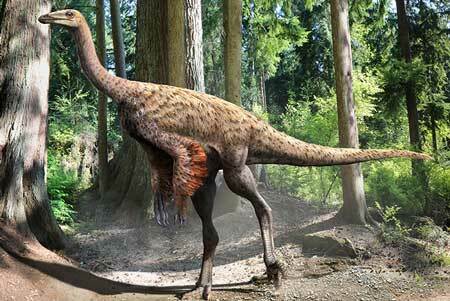 Together, these new features are providing the fullest depiction yet of the plumage sported by Ornithomimus, said Aaron van der Reest, a paleontology student at the University of Alberta who made the find. “We now know what the plumage looked like on the tail, and that from the mid-femur [thigh] down, it had bare skin,” said van der Reest, in a press statement. Small, almost downy feathers appear to run along the chest, back, and top of the tail, but not the tail’s underside, he noted. Similarly, the plumage is scant along the neck and stops altogether at the middle of the thigh, leaving the dinosaur with mostly bare-skin legs. This pattern of plumage suggests that Ornithomimus likely bore a striking resemblance to at least one modern flightless bird. “It would’ve looked a lot like an ostrich,” van der Reest said. This could have important implications for understanding the physiology of Ornithomimus and other theropods, he added, particularly how they controlled their body heat in the warm climate of the Campanian age. “Ostriches use bare skin to thermoregulate,” van der Rest said. Eons of pressure under Alberta’s ancient sediments have left the fuzzy feathers “extremely crushed,” according to the statement, but scanning electron microscopes have revealed the their fossilized protein structures in all three dimensions within the rock. The specimen also includes a distinct set of ridges in the rock, left by the folds of the dinosaur’s skin where the upper thigh met the abdomen. 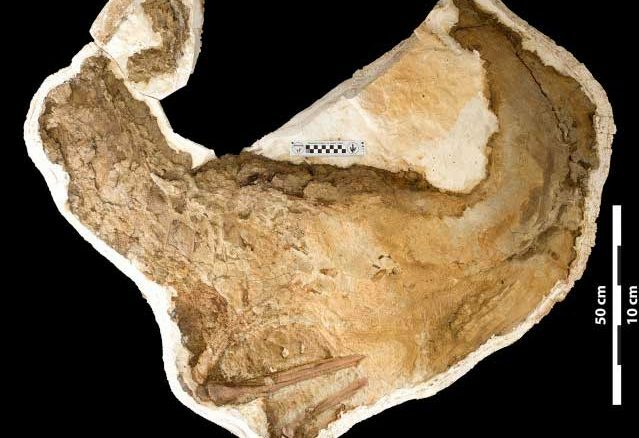 It’s the first time that this web of skin has been observed in any dinosaur, the researchers said, and its orientation is similar to that found in modern birds. The team speculates that the placement of this big skin web may have allowed Ornithomimus to fold its legs underneath it more completely than other theropods could — an ability that may have been useful while resting or brooding on a nest, and yet another trait that it shares with birds. It’s further evidence of how Ornithomimus makes good on its name, said Dr. Alex Wolfe, an Alberta paleontologist who co-authored the research. “This specimen … tightens the linkages between dinosaurs and birds, in particular with respect to theropods,” Wolfe said in the statement. Van der Reest agreed, adding that the new fossils adds important data about the entire family of dinosaurs to which Ornithomimus belonged. “We are getting the newest information on what these animals may have looked like, how they maintained body temperatures, and the stages of feather evolution,” he said. For now, one of the key questions that remains is how exactly the Dinosaur Park specimen came to be so well preserved. Van der Reest and his advisors report their findings in the journal Cretaceous Research. Amazing that after millions and millions of years, the flesh is still in tact!